NOTE: FACTORY UPDATED PART NUMBER IS 07K905715G. UPON ORDERING YOU WILL RECEIVE THE MOST UP TO DATE PART. 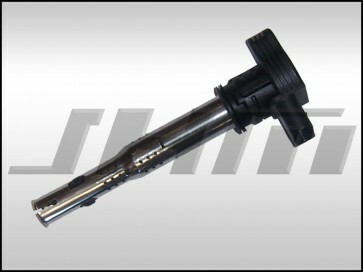 These are brand new, OEM Coil Packs or Ignition Coils as found in the Audi-VW 2.0T FSI and the Audi B7-RS4 4.2L FSI motors. These coil packs are the latest revision part number from Audi-VW. If you're having misfire issues or are just looking to update your car to the latest revision coil packs, these are the part you need! Many people use these coil packs along with the 034Motorsport FSI Coil Adapter Plates (found in this same section) to upgrade their B5-B6 A4 1.8T or B5-S4 2.7T to these more reliable and cost effective 2.0T FSI Coils. The OEM Part Number for these is: 07K 905 715 G or 07K905715G. NOTE: These are priced individually. If you need more than one (i.e. 4 for a 1.8T or 6 for 2.7T or 8 for your B7-RS4), make sure you change the quantity before checkout.